CLICK HERE to visit our Flickr Photo page and look for the album labeled with your event info. Feel free to browse, or download them at will. Please note that 90 days after the event, photo albums may be deleted. The first show I saw was Elvis’ 81st birthday party at Chuy’s. Oh my goodness! When Mike knelt on one knee, wrapped a scarf around my neck and held my hand while singing a love song, he brought me back to my school girl crush on Elvis with his albums hanging on my wall. I recognized Mike’s portrayal of Elvis as authentic and respectful of his legacy. It was an extra blessing to learn the Elvis trivia Mike shared. It gave me a new appreciation for the contributions Elvis gave to the world. 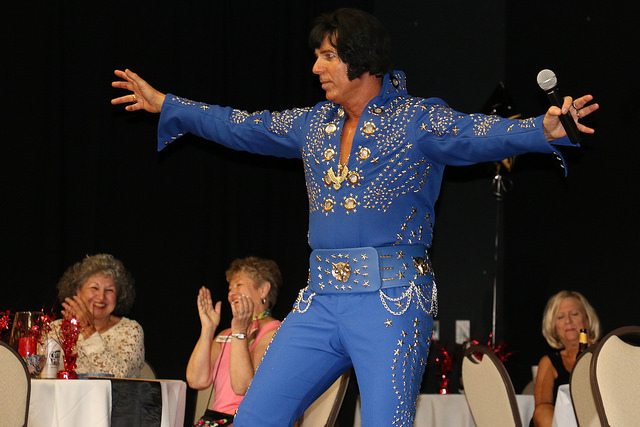 As a tribute to the true nature of Elvis, Mike volunteered to perform for our Special Friends Church yesterday. Our special needs members experienced an unprecedented interaction with a favorite hero, Elvis. Mike was so patient and kind, making each individual feel important. He sang gospel music for us then gave a brief message relating his portrayal of Elvis to how we are to be like Jesus. Awesome experience for us all. Thank you, Mike! May the Lord prosper your talent and endeavors. I enjoyed th e event this afternoon at the City of Killeen Picnic that Mike stand a tribute to Elvis Presley. Thank you for the good time, I really enjoyed it. God bless you. thank you so much it was a lifetime moment….. Thank you for the memories in Corsicana,last night.